To show the unfailing quality and steadiness of production traditions using stills from photo reports combined with modern elements. 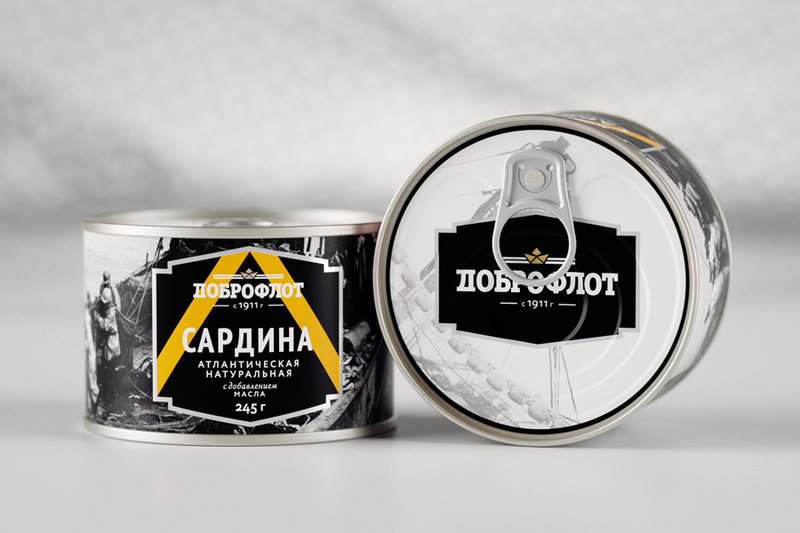 Canned fish “Dobroflot” is produced on a floating fish cannery “Vsevolod Sibirtsev”, a giant ship that has become home for real “sea wolves” that are no strangers to storms and wild wind. This is hard work for brave people who respect tradition and speak their own language. This is why to design the canned fish packaging were chosen simple geometric forms that refer to the generally accepted system of marine signal flags. Color elements are depicted on the background of genuine black-and-white photos from the company’s history. These photos have been diligently collected from local history museums and from personal photo archives of the staff. The sign “Made in the sea” once again lays stress on the specifics of production and on the quality of the product. This entry was posted in Ohmybrand | Разработка позиционирования, упаковки, торговой марки, названия, стратегии., package, what, works, market, federal and tagged id, package, strategy. Bookmark the permalink.